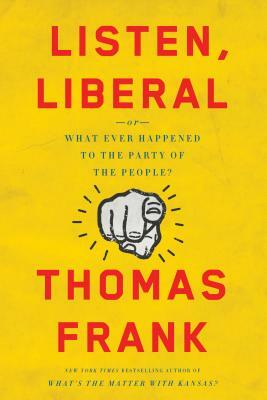 Home » Columbus: Thomas Frank on "Listen, Liberal"
Columbus: Thomas Frank on "Listen, Liberal"
Join us on Tuesday, March 15th at 7pm for a discussion with Thomas Frank on his new book, Listen, Liberal: Or, What Ever Happened to the Party of the People? Synopsis: It is a widespread belief among liberals that if only Democrats can continue to dominate national elections, if only those awful Republicans are beaten into submission, the country will be on the right course. Thomas Frank is the author of "Pity the Billionaire", "The Wrecking Crew", "What's the Matter with Kansas? ", and "One Market Under God". A former opinion columnist for "The Wall Street Journal", Frank is the founding editor of "The Baffler" and a monthly columnist for "Harper's". He lives outside Washington, D.C.